Our project covers a wide variety of occupations, one of the key questions is how newer, potentially professional, occupations compared to the older ‘traditional’ professions of the law, church and medicine. The case of Thomas Hayter Chase (1814-95) provides an interesting example that can be used to consider how one emerging profession, the police, was understood by the public. Thomas Hayter Chase was appointed superintendent of police for Brighton in 1844 following the murder of the town’s first superintendent, Henry Soloman, by a prisoner he was interviewing. Chase had previously been superintendent of police on the Isle of Wight. He held the office from 1844 until 1853 and during this time appeared frequently in the Brighton newspapers in his professional capacity, notably when giving evidence in court. He was also a rather controversial figure as noted here. He was often criticised in the Brighton Guardian, a liberal newspaper edited by Levi Emanuel Cohen. Chase felt such criticism was unjustified, as he wrote to a rival paper the Brighton Gazette in 1853: ‘I have much to congratulate myself upon in having been abused and mis-represented for more than nine years by this editor’. Brighton’s Improvement Commissioners (the local body responsible for the town’s police force at this date) took a rather more dim view of Chase’s behaviour. They pointed out inconsistencies in Chase’s account of his actions and that he had made attempts to obscure the reality of Amphlett’s situation and actions from the investigation undertaken by the Improvement Commission’s Police Committee. One Commissioner rather intemperately stated ‘Any one who made it his business to encourage swindlers ought to be transported.’ This issue arose at the moment at which the local government of Brighton was being fiercely debated. Some sought Brighton’s incorporation as a municipal borough with a town council, others felt the current system of government by the parish vestry and Improvement Commission was adequate. As such, another Commissioner took advantage of Chase’s actions to launch into an attack on the Commissioners and to demonstrate that Brighton needed to be incorporated. Although the Commissioners agreed that Chase had not broken the law, they felt he had acted with ‘folly and indiscretion’ and as a consequence voted for his dismissal by a majority of 30 to 4. Clearly Chase struggled following his dismissal. On 15th August 1853 a meeting ‘of several respectable inhabitants’ took place to consider how to help Chase and his family in their ‘present unfortunate position’. They agreed to open a subscription to provide him with assistance. By the end of October 1853 they had raised the not inconsiderable sum of £215.11s.0d. and a concert was held on the 27th October to raise further money. Donations came from a number of very prominent Brighton residents including the Vicar of Brighton Rev. H.M. Wagner, and from a number of other individuals included in our study, such as Richard Mallam Webb a local auctioneer and wine merchant who would be Brighton’s Mayor in 1870. 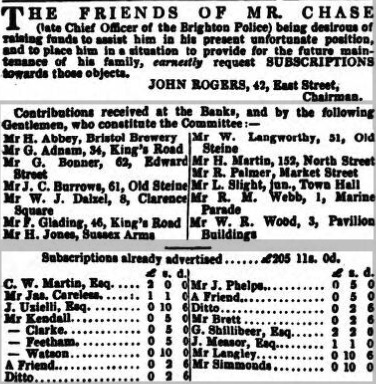 The Friends of Mr Chase, Brighton Gazette, 27/10/1853, p. 1. Charity in Victorian Britain has been written about extensively. Yet most of the focus has been on the history of humanitarian international charity or of poverty relief charity. Furthermore, most of studies have focused on philanthropic bodies. The case of Thomas Hayter Chase provides us with an example in which the charity was informal and aimed at an individual of relatively considerable social status. Plenty of individuals suffered similar distress every year as witnessed by the increasing cost of poor relief in Brighton, yet none of them received over £200 of support, the question, then, is how was Chase able to command this attention? What made the inhabitants of Brighton think he was worthy of such considerable relief? His role as superintendent of Brighton’s police for nine years was presumably important. He had been a prominent figure in the town’s public life throughout that period, wielding significant power over the lives of the town’s inhabitants. He had also himself subscribed to numerous charitable causes throughout that period, subscriptions that were recorded and published in the local press. Such public service and charitable behaviour gave him sufficient status to be able to make a claim on the resources of the Brighton population. This, coupled with his own presentation of himself as having acted foolishly but nobly, made him an appropriate figure for charitable relief. The incident reveals starkly the power and status that public service could convey on professionals in nineteenth-century Britain. A former police chief who was out of work for a relatively short period received over £215 in charitable aid; that amount, raised in just two months, this was more than his yearly salary (which was £194 pa). This is in stark contrast with the relief available to paupers in Brighton in the 1850s. This blog was written using the digitised copies of the Brighton Gazette accessible through www.findmypast.co.uk.